Does your property suffer from unsightly, damaged, moldy wooden or concrete flooring? Turn your property into a clean, durable and beautiful conversational showpiece! Thank you! We'll call you soon with your free estimate. EverStone of Southwestern PA brings you a blend of North America's most beautiful, natural, decorative stones, combined with our proprietary epoxy resin. EverStone can be applied to almost any structurally sound interior or exterior concrete surface, or any interior wood floor that has been properly prepared. EverStone is hand troweled so correcting uneven, dangerous surfaces is a breeze. The EverStone Product is also a great insulator, allowing air to circulate throughout the product. It will not transfer ground temperatures to your feet, like concrete or tile and has become the premier floor covering for any area that gets damp, wet or flooded. 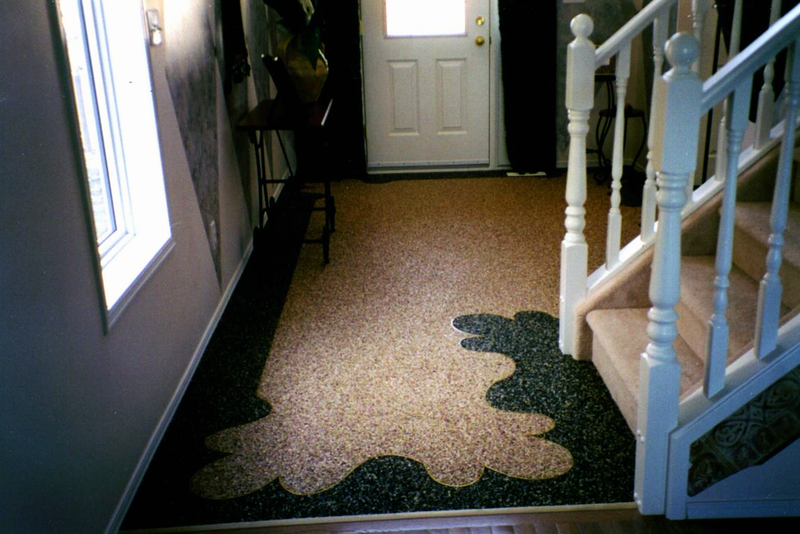 It does not mold, peel, lift or discolor like carpet or tile and can be easily cleaned and maintained. When the EverStone System was first developed, we knew that our top priority would always be Customer Satisfaction. We have upheld that "top priority" by taking extensive measures to produce the highest-quality, eco-friendly, stone & epoxy flooring system available today. Our system was designed by first identifying any weak points that a stone & epoxy floor could have and then developing solutions that would reinforce and protect those areas from potential damage. Next, we contracted with a National Epoxy Coatings Manufacturer that has been formulating high-strength epoxy coatings for over 70 years. After meticulous research, development and testing, we were able to produce a proprietary 100% Solids, High-Strength, Water-Clear, Epoxy System that is V.O.C. compliant and even meets California's strict C.A.R.B. standards, A.S.T.M. D-2697. Weather Resistant: Our product is resistant to ice and freezing weather conditions. The use of salt, calcium chloride or magnesium chloride will not damage it. Elasticity: Built in elasticity allows for most subsurface expansion and contraction. This unique property helps to limit the amount of damage caused by extreme temperature changes or substrate movements. Vertical Applications: Our stone & epoxy mix is so unique that it can be applied just about anywhere, including steps, patio edges and walls. Easy to Maintain: An occasional use of a power washer or a carpet cleaner and a simple detergent will keep EverStone beautiful for many years. Repairable: Our product can be repaired much easier than concrete or tile should a ground movement crack occur over time. 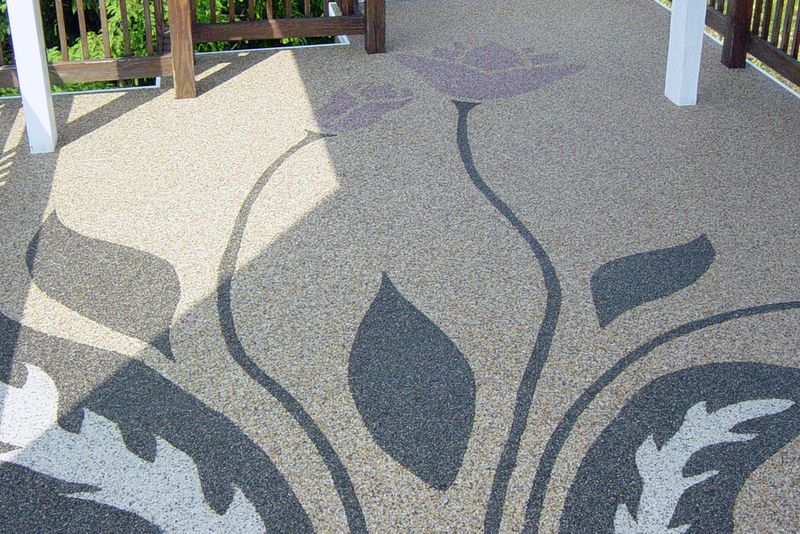 Our small, multi-colored stone make these repairs easy and virtually invisible. Water Disbursement: Our product is porous and allows water from rain or melting snow to drain through and eliminates unsafe, unsightly puddles. Aesthetics: EverStone's blend of North American stone and custom inlay designs are the perfect fix to any ugly, uneven surfaces in your home or workspace. Complete the form and we'll call you back ASAP!